She has also provided a beautiful photo history on how she created the piece and the the materials she used. Definitely take a peek and roam around the rest of her blog as well. You won’t be disappointed. 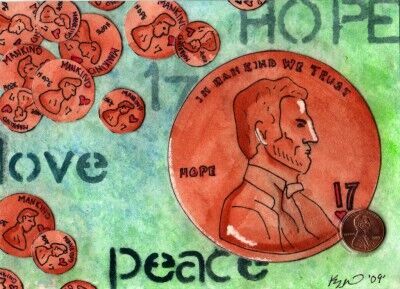 This entry was posted in Penny Art, Penny Experiment and tagged #17, in mankind we trust, Kelly Biddle, Kelly Janice, penny, Penny Art. Bookmark the permalink.